ARE YOU "IN THE KNOW"? Start a free trial of our HE intelligence service HEi-know this month to qualify for 2 months extra free. A "worrying convergence" of challenges is threatening the vital role of higher education in supporting the UK's engineering sector, warns a new report. Thousands of students could be denied government funding to study abroad if the UK leaves the European Union without a deal, Universities UK has warned. Brexit woes and the other "B", Blue Monday, set the tone for a week of HE news and views in which unconditional offers, support for disabled students, and freedom of speech struck a chord for Alison Johns, Chief Executive of Advance HE. Do unconditional offers amount to "pressure selling"? The Office for Students has increased pressure on universities to halt the “dramatic” rise in unconditional offers, particularly those with “strings attached”. Brexit is unlikely to affect the demand for graduates or halt an upward trend in the number of graduate jobs, some of the UK's largest employers have said. HEi-think: Keeping the plates spinning in HE -- who'd be a Registrar? As higher education changes to meet a growing number of challenges, so the role of registrar has evolved and become more complex, observes Graham Cooper, Head of Education at Capita Education Software Solutions. A White Paper from Media FHE and Capita is the latest of a number of reports that show the range of responsibilities and issues registrars are now expected to take on, and how they feel about them. 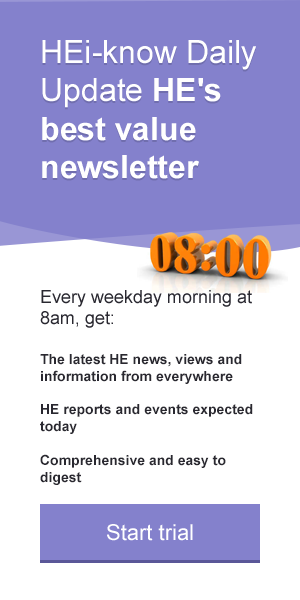 Weekly HE news review: Storm clouds gathering? With Brexit inevitably dominating the headlines this week, Rhiannon Birch, Director of Planning and Insight at the University of Sheffield, looks at what else was also making news in higher education. Universities are preparing for a “no-deal” Brexit by flying students back to the UK early, trying to secure supply chains and identifying contingency funds to cover unexpected scenarios. Professor Jon Scott, Pro Vice-Chancellor Student Experience at the University of Leicester, picks out the dominant themes in higher education news of the past week. Research England has published a consultation document outlining how the Knowledge Exchange Framework could work, and invited universities to take part in a pilot of the proposed system. Recent reports on graduate earnings and value for money in higher education have suggested that those studying art and design are losing out, and there is speculation that the Augar review could recommend lowering the tuition fees cap for such programmes. But HE art and design leaders warn that a range of important factors, from more accurate information on graduate earnings and opportunities to the value of art and design industries to the UK economy, are in danger of being ignored or missed. UK Research and Innovation has announced a "pioneering and ambitious new approach" to tackle some of the world’s most pressing challenges through a £200 million investment across 12 global research Hubs. The higher education agency Advance HE has announced six new board members and the formation of a new Equality, Diversity and Inclusion committee. The University of Leicester is to receive £50,000 funding to support the design of a Low-Cost Access to Space facility at Space Park Leicester -- an initiative to create a global hub and collaborative community for businesses, researchers and academia based on space and space-enabled technologies. The University of Sheffield is to lead three major research projects exploring the long-term governance implications of Brexit.